The boat hoist at Embarcadero Marina will no longer operate and eastside parking is roped off in anticipation of a new parking garage for boaters. DANA POINT — It’s finally happening. Dana Point is about to get a brand new harbor and the developers, collectively known as Dana Point Harbor Partners (DPHP) and who recently struck a deal with the county of Orange to lease the waterfront property for the next 66 years, isn’t wasting time in getting started. The county’s presence in the harbor has been greatly diminished, Embarcadero Marina’s boat hoist is no longer accessible due to safety issues (and will not come back – the hoist is not in revitalization plans), and work on the colossal undertaking of restoring Dana Point’s harbor to its once glory is underway. The Log received a phone call from an unnamed source claiming the boat hoist had been taken down. The caller claimed that boaters had been given notice that the hoist would stay up until Jan. 1, but it had been roped off around Thanksgiving weekend. Staff at Embarcadero Marina, which is located on the east side of the harbor along Golden Lantern Street, passed on a message from The Log to general manager Ken Stetson, but no response was given by press time. As of Dec. 19, the boat hoist was not operating and about two-thirds of the parking lot on the east end was also marked. In previous meetings, Bryon Ward, one part of DPHP and a partner for Burnham Ward Properties, had mentioned the first project would be working on a parking garage to be designated for boaters. In some regards, planning for the structure was not a surprise as it had been mentioned during at least two public meetings. On Dec. 20, The Log had a phone conversation with Joseph McCarthy, representation for Bellwether Financial Group, the partner for the marina side of DPHP. The dry boat storage portion of the project also operates under a separate LLC, but is owned by DPHP as well. According to McCarthy the boat hoist was removed for two reasons. The first reason was the hoist was seldom used, according to Embarcadero Marina’s harbor manager. The second reason for removing the hoist: It was deemed unsafe. In addition, McCarthy said Vintage Marina Partners, the original operators of the boating facilities at Embarcadero Marina, were asked to present a safety plan. However, Vintage Marina Partners have not submitted a plan to date. McCarthy also confirmed that the hoist is not in the plans for revitalization; boaters will not be seeing a rebuilt or safer hoisting facility in the future. 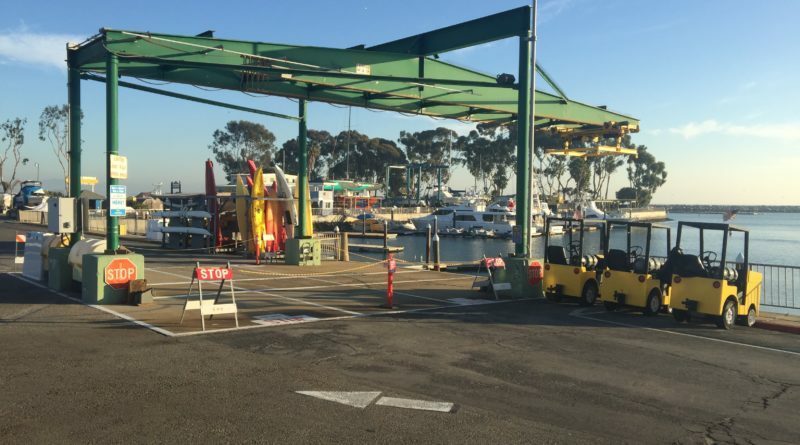 While the boat hoist is gone, DPHP have held at least three public meetings with Dana Point Harbor Advisory Board (DPHAB) and several sources have stated DPHP have reached out to boaters and the local community to gain feedback for the project. Amenities for boaters, and all visitors to Dana Point, are expected to be grand including a mixture of the harbor’s quaint, historical charm and modernization. Will the county have a presence in the new harbor? In 2005, the county of Orange created an independent department to operate Dana Point’s Harbor and began work to manage the revitalization project directly. There were certainly struggles, which can be seen by some of The Log’s past coverage. The independent department collapsed in 2016 and was merged with O.C. Parks. As of Oct. 30, the county passed on the torch of managing Dana Point Harbor to DPHP. When The Log reached out to the county of Orange for commentary, Public Information Officer Molly Nichelson advised reaching out to DPHP’s representation. Follow-up questions were asked concerning the county’s occupation in the harbor, but leading up to Christmas there was not a response in time for press. If more information becomes available, this story will be updated online. McCarthy stated the county’s harbor manager, Shannon Levin, is still on site and operating from OC Sailing and Events Center. County staff is still overseeing Baby Beach. The county’s representation for the projects, however, may have been significantly cut back, but it is unclear exactly how much involvement and input there will be as DPHP move forward. In the past, it has been difficult to gather feedback from the county. Leading up to the lease signing, however, county staff were communicative about the deal including Supervisor Lisa Bartlett who spearheaded the movement for revitalization in Dana Point. When it came down to the wire, this project was not one that could be afforded and carried out by the county leading the private sector to take on the responsibility and most costs to revitalize the historic, yet worn and tired, harbor front. Whitlock, who has a lengthy career at Dana Point Harbor and witnessed the transition when the county took over in 2005, also commented on the state of the infrastructure in Dana Point Harbor. The buildings are old, and similarly to infrastructure in Redondo Beach, they could potentially be a safety hazard down the line. At this point, DPHP have designated construction phases beginning with the parking structure aforementioned. McCarthy, however, stated that the tape was also meant to deter visitors in the harbor from getting too close to the hoist/boating equipment that could be dangerous. This process of building the garage first will allow local businesses and boaters to operate as normal as the harbor is revitalized. The site of Dana Point Marina Company and the buildings near the marinas on the east side will become hotels according to renderings. DPHP have hit the ground running and from the looks of the parking lot, it appears ground could be broken on the parking garage in the near future. DPHAB, the newly formed harbor-commission-like agency, has been involved in the revitalization process at great lengths. The official website has resources about the revitalization at dphadvisory.org/harbor-revitalization with a construction schedule. There does not appear to be a parking structure undertaking slated during the holidays according to the documents online, however, there does mention dry boat storage entitlement and design phase beginning on Nov. 1, 2018. For more information, contact James Lenthall, President of Dana Point Boaters Association, at jameslenthall@danapointboaters.org or DPHAB at contact@dphadvisory.org. I would like to see The Log comment on the lay-offs of marina personnel, outsourcing of some marina jobs and the unexpected boat slip increases. Concerning the boat slip increases, it was explained that DPHP has instituted a new way to calculate rates based on boat length. Surprise most all rents when up around $50.00/month or more. Not sure what the boaters are getting in return. Looks like a money grab to me. Interested in what you can find out as I know information has been very hard to come by. The parking garage is NOT going to be dedicated exclusively to boater parking.